This past weekend Jesse and I took another trip to Hong Kong. We had a lot of fun, but it wasn’t all play time – we went to Hong Kong so that Jesse could officially get his Z Visa, basically a resident visa! It’s weird when things feel like they are such a long time coming, then once they happen it feels like it was all so fast! Who would have thought we would be living in China? Crazy. We had these Stuffed Peppers early last week before our trip, and I was hoping to get this post up while we were in Hong Kong, but I completely forgot to take my lap top with me! Better late than never, though, because we really loved this dinner. 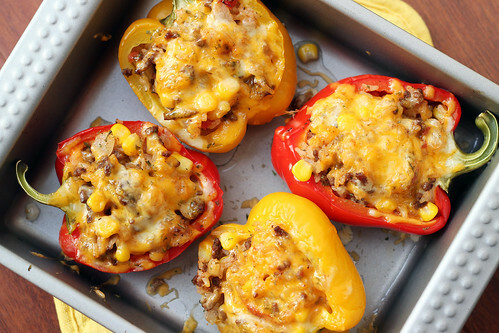 Stuffed Peppers are bright, colorful, filling, and delicious. *I wasn’t able to add the black beans this time (I had dry beans soaking and cooking all day but they refused to soften! ), but I think they would make for a really great addition. **Also, I only had 2 bell peppers, but I made the full amount of the filling. I used the left over filling on top of flour tortillas that I crisped in pan. It made for one heck of a tostado! Bring a pot of water (about 4 quarts) to boil. Add the rice and boil for about 12-15 minutes, or until the rice is tender, then drain. (I find this method, cooking rice like pasta, is so much easier and always delivers perfect rice!) Alternatively you can prepare the rice according to the package. Meanwhile, in a large skillet over medium-high, heat the olive oil. Add the green onion whites and ground beef. Cook until the beef is no longer pink, about 3-5 minutes. Season with cumin, paprika, and cayenne red pepper. Stir in the rice, corn, green chilies, diced tomatoes, and 1/2 cup of cheese. Add 1/2 cup of water to the bottom of a 9×13 baking dish, then arrange bell peppers, cut side up in the dish. Fill the peppers with the filling. Cover the dish tightly with foil. Bake for 30-40 minutes or until the bell peppers are tender. Uncover and add the remaining cheese. Bake for 5-8 more minutes or until the cheese is bubbly and turning golden brown. 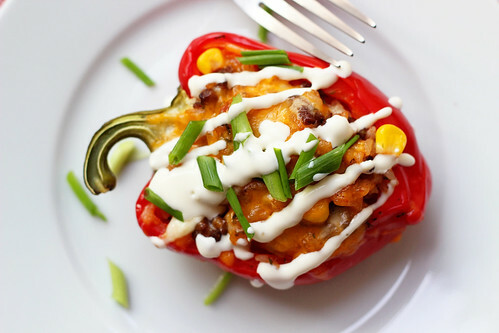 While the peppers are baking, whisk together the sour cream, garlic, and lime juice. If the consistency is still too thick, add up to a tablespoon of water if it needs to be thinned more. Drizzle the sour cream sauce over the peppers, garnish with green onions and salsa (if desired), and serve. >What a beautiful picture!! 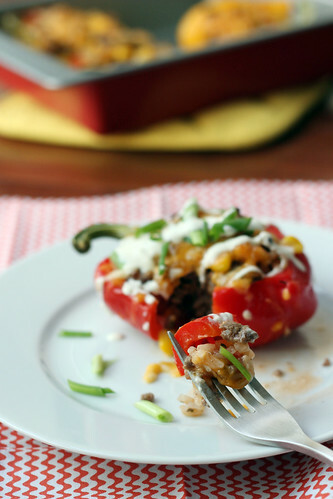 I am making a similar stuffed pepper soon, I hope they are as good as these look! >Hi dear! I just discovered your blog and I really like it! Love your outgoing personality (and your cooking looks AMAZING!) I cordially invite you to check out mine! Maybe we can follow each other! 🙂 Bisous! >These are gorgeous and I love the southwest flavors! >Great recipe. I made it tonight and it was really good. In the directions you forgot to advise when to add the rice and so then did I. Oh poo. Still it was lovely. Make your corrections and thank you. I think I will also mash the black beans a bit to make the stuffing more homogeneous. >Well shoot! Correction has been made. Glad they still turned out! I made these tonight and they were very good. I used 1 each~ red, orange and yellow pepper. The directions don’t mention the black beans so don’t forget to add them if you’re using them 😉 Also I used sour cream and it was good but might try yogurt next time. I made these the other night for my family and they were absolutely amazing! They were so good that they begged me to make them again! Great recipe! I made these tonight and they were amazing! I left out the meat and used 2 ears of fresh corn and 3 serrano chiles instead of canned veggies. Thank you for posting this recipe!